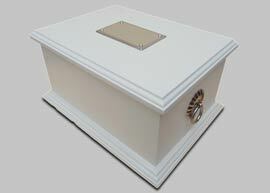 After a cremation, there are a number of options for cremated remains. Remains can be scattered in the crematorium grounds, which can be arranged by appointment on request. Some crematoria also offer other options, such as a plot for the remains. For those who would like to have somewhere to visit which can be marked with a plaque, the remains can be buried in a cemetery or churchyard, either in a cremated remains plot or in an existing grave. 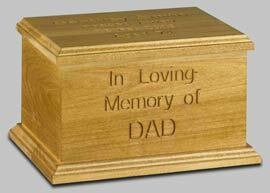 Wooden caskets are the traditional choice when cremated remains are to be buried in a cemetery or churchyard plot, but can also be retained at home. Our range includes personalised options incorporating custom engraving, designs or photographs. 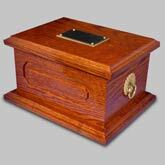 If you would prefer to scatter the remains yourself, we can return the remains to you in our nature urns. Retaining some or all of a loved one’s cremated remains can give a reassuring physical presence which brings comfort during the journey of grief. Collecting a loved one’s treasured possessions – such as jewellery, letters, photographs and maybe a lock of hair, and keeping these together in a special place can also help to keep them close at heart. 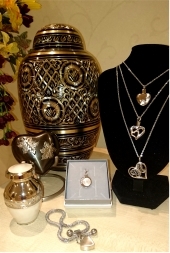 We offer a wide range of options, such as keepsake hearts, teddy bears, urns and jewellery, for retaining both cremated remains and treasured keepsakes, either temporarily or permanently. These can be found in our Brochure and Price List, and also our Urns and Jewellery Brochure.